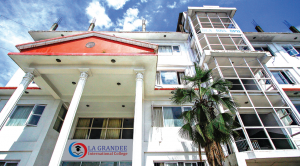 Established in the year 2000 and with years’ long experience in the academic sector, LA GRANDEE International College has now been authorized as the Japanese Language NAT TEST Center for Pokhara. After Kathmandu, NAT TEST Center-Pokhara, is the second to be registered as the test center of Japanese Language NAT TEST for Nepal. It has been conducting the test since 2013. Being centrally located and with the refreshing environment of Pokhara, this center is one of the best test center either from the perspective of its reachability or also from the perspective of getting sound environment for taking the test. This center conducts the test as per the processing rules set by the authorized company Senmon Kyouiku Publishing Co. Ltd., Japan.